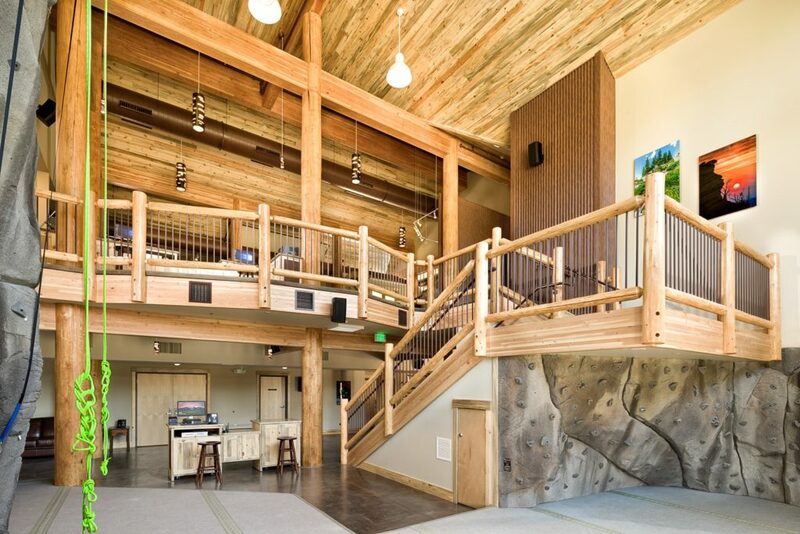 Former CEO Kent Meyer had a vision to create a space to connect YMCA of the Rockies guests with the outdoors, while providing an opportunity to learn about the environment they’d be spending time in. 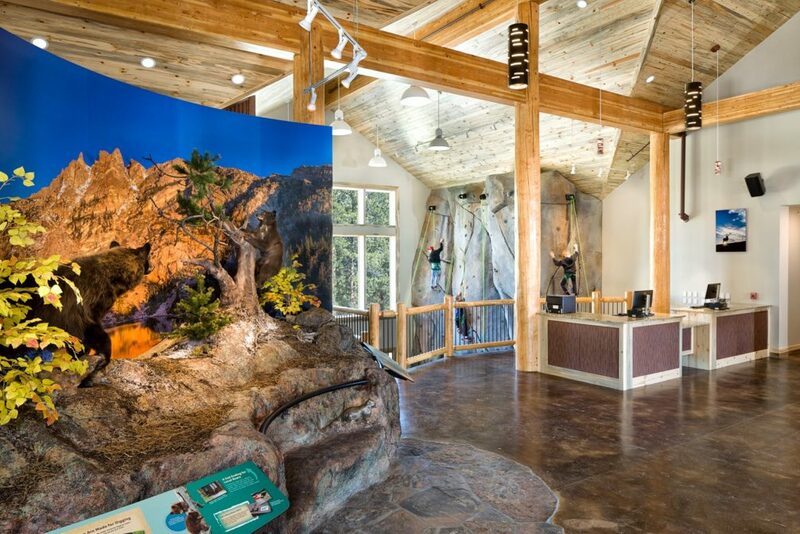 The Boone Family Mountain Center serves as a Nature Museum and Outdoor Activities hub. When we were asked to design this space, we couldn’t have been happier. The use and purpose of this building aligns with our own core values – we believe in the power of connecting with the outdoors and the importance of minimizing our impact along the way. This project accomplishes both. Slated to achieve LEED Certification, the structure was intentionally positioned on the site to fit the scale of the surrounding cabins but feel like an expansive mountain lodge inside. Large windows bring the outside in, providing a unique experience for those scaling the ‘indoor’ climbing wall. Resources abound to learn about the regional flora and fauna, hiking and biking routes and the best local fishing. It was important to use regional materials such as beetle kill pine, sandstone, plus be mindful of responsible materials that have low emissions, conserve water and reduce waste. 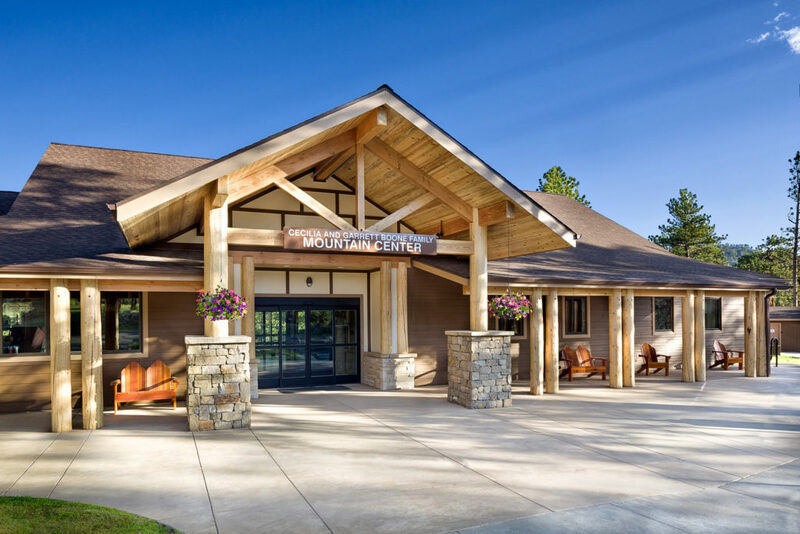 The exterior design needed to fit the YMCA motif, yet it was paramount to us that the building was nestled into the hillside in order to minimize the impact it had to the surrounding guest cabins. The entry includes an inviting, long & low porch to scale to the site. Upon entering, the interior opens up into high vaulted ceilings with log and beamwork reminiscent of a classic National Park mountain lodges. Even the light fixtures were designed to mimic the look of surrounding aspen trees.The climbing wall was located next to large windows so climbers could feel like they are ascending into the treetop canopy beyond. The outdoor classroom area consists of a patio surrounded by curved stone walls anchoring the space to the surrounding land. Outdoor education can spill out of the interactive/museum display area into the open where people can interact with the real thing. The project is anticipated to achieve LEED Certification, an important goal in the construction of a building designed to support and educate guests about the sometimes fragile alpine environment. Design goals included energy and water reduction, the use of regional and recycled materials, limiting construction waste, reducing light pollution and managing indoor air quality. The stewardship associated with this project aligns with our own philosophy of encouraging others to have a deep connection to the outdoors while minimizing impact on the environment at the same time.